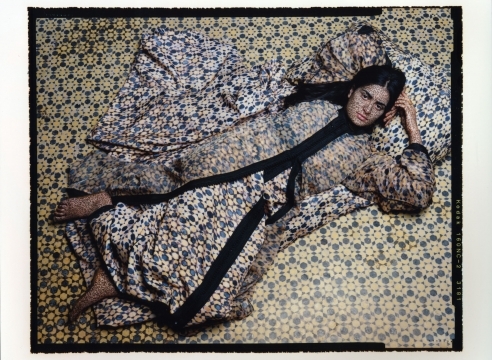 Edwynn Houk Gallery is pleased to announce an exhibition of large-scale photographs by Lalla Essaydi from the artist’s most recent series, Harem Revisited and Bullets Revisited. The show will be on view from 16 May through 22 June 2013 with an opening reception for the artist on Thursday, 16 May from 6-8pm. Lalla Essaydi was raised in Morocco and spent many years in Saudi Arabia, and although she was educated in Europe and the US and now lives in New York, this experience of traditional Islamic life was fundamental to her unique approach to the examination of the identity of the Muslim woman. 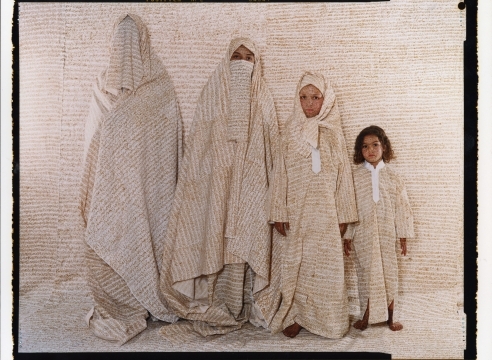 Utilizing a unique working method and set of visual devices that she initiated in 2003 for the iconic series, “Converging Territories,” Essaydi applies many layers of text written by hand with henna in Islamic calligraphy to the subject’s faces, bodies, and environments. Then, she arranges her subjects in poses directly inspired by 19th Century French painters such as Ingres, Delacroix and Gérôme, whose Orientalist paintings featured the harem and the eroticized Arab female body. Using the perspective of an Arab woman living in the West, Lalla Essaydi reexamines and questions this representation of the Arab female identity. While Essaydi’s new work continues to explore this theme, the subjects of Harem Revisited are clothed in elaborate caftans and their environments are now covered with these richly adorned fabrics. The draperies are dense and have such rich embroidery and complex patterns that when seen altogether, the effect is dizzying, essentially turning the women themselves into objects of decoration, camouflaged within their environments. They become, in effect, a metaphor for the essence of Essaydi’s exploration. These vintage textiles, which were created between the 17th century to the early 20th century for use in wedding ceremonies, to decorate palaces and the harem area, were all generously loaned to Essaydi from the Nour and Boubker Temli collection. In the works from the Bullets Revisited series, a scene is set in the sort of room one finds in Orientalist painting. 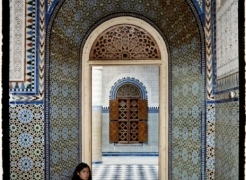 Each room – its tiles, woodwork, and other décor, as well as the women’s clothing- is reproduced in faithful detail. But these scenes are created with bullet casings that turn the domestic space into a psychological one, charged with the violence within contemporary society. Lalla Essaydi’s work is represented in a number of collections including The Art Institute of Chicago; The Museum of Fine Arts, Houston; The Museum of Fine Arts, Boston; The Virginia Museum of Fine Arts, Richmond; The Columbus Museum Of Art, Ohio; SF MoMA, California; the Jordan National Museum; the North Carolina Museum of Art; the Brooklyn Museum of Art, New York; The Arab Museum of Modern Art, Qatar; The British National Museum, London; The Fogg Art Museum, Cambridge, MA; the National Museum of African Art, Smithsonian; and Le Louvre Museum, Paris, France amongst many others. A new exhibit at the Canadian War Museum is aiming to challenge Western perceptions of the Middle East. She Who Tells a Story is set to open Dec. 6 and features nearly 85 photographs taken by female photographers from the Arab world. Lalla Essaydi, a Moroccan photographer and artist whose work is displayed in the exhibit, spoke to CBC's All In a Day at its opening on Tuesday afternoon. Her piece, a triptych titled Bullets Revisited #3, features a reclining woman surrounded by bullet casings. "This work is inspired by the Arab Spring," she said. "I wanted to represent these women who have been fighting among men for their own rights." 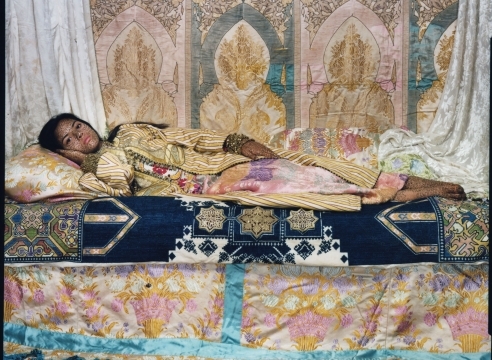 Converging Territories is a photo series conceptualized and executed by Moroccan-born photographer, Lalla Essaydi. 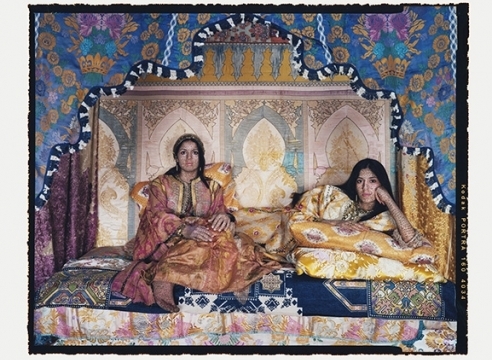 The photographs feature Arab women as odalisques, and objects representative of the harem, as they confront the veil of a Western perspective of Orientalism. Borrowing the words of Whitman, the women in this series are large, they contain multitudes, and to wholly appreciate the granduer Essaydi encourages her viewers to dismiss stereotypes when engaging with her work. 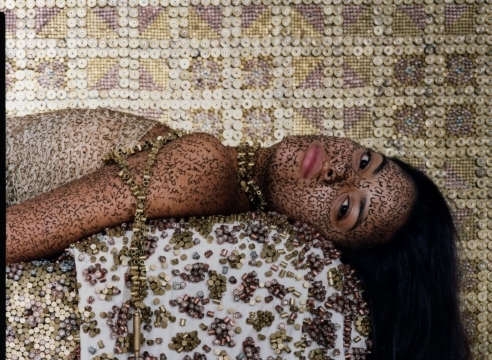 Moroccan artist Lalla Essaydi’s photographs set out to provoke viewers into new ways of seeing by mimicking and subverting Orientalist tropes. Beautiful but reductive, fetishistic and steeped in colonialism and imperialism, Orientalist paintings invented a Middle East that never existed for an audience that wished to see its desires and prejudices reinforced. Moroccan photographer Lalla Essaydi hijacks this imagery to create photographs that deliberately subvert Orientalist views. I find this image transfixing. Having long admired 19th- and early-20th-century Orientalist art, I enjoy Lalla Essaydi’s fresh approach to it. Here, the artist re-creates a French School harem pose, herself applying the hennaed Islamic calligraphy covering the woman’s body. Antique textiles are central to my projects and those used in this composition are sensational. Her bed, wrapped in a strong indigo-blue carpet, contrasts with the sweeter surrounding colours and brings the subject forward in the composition. Her layers of clothing appear to extend out into the profusion of silks around her, adding to her allure. This highly decorative, impactful piece provides a window into a secretive world, a place the artist describes as a “dangerous frontier where sacred law and pleasure collide”. The title of a new exhibition at the National Museum of Women in the Arts , “She Who Tells a Story,” undersells the high quality of the work therein. The name is borrowed from an Arabic word, rawiya, which also refers to a group of female photographers working as a collective in the Middle East. But the title makes it sound as if this provocative show — devoted to photography by women from Iran and the Arab world — is just another exercise in narrative, just more storytelling, a needless addition to the overflowing swamp of narrative that drowns out critical thinking. Of all the assumptions about the Arab world, “maybe the most insulting is the idea that women from our region are oppressed, and therefore weak, backwards and cannot think for themselves,” Yemeni photographer Boushra Almutawakel says. “Yes, there are cases of oppression for sure, yet in spite of it all I feel women from our part of the world are strong and resilient, and we are intelligent, and can speak for ourselves.” Ten of Almutawakel’s works — among them a series of portraits of a mother, her young daughter and her daughter’s doll increasingly veiled until they fade into the black background — appear as part of the National Museum of Women in the Arts’ newest exhibition, “She Who Tells a Story: Women Photographers from Iran and the Arab World.” Running through the end of July, the show features 83 photographs and one video installation by a dozen contemporary female artists, each exploring stereotypes in her own way.